Embarking on a quest to find a life partner, build a suitable home together and start a family is an alluring dream that not only humans strive to achieve. In the upcoming Disneynature documentary, ‘Penguins,’ which Walt Disney Studios Motion Pictures is set to distribute in theaters next Wednesday, the title aquatic bird is just as determined as people to fight back against any challenges they face in order to achieve their goals of everlasting happiness. That contentment will especially be honored when Disneynature continues its conservation tradition: for every ticket sold opening week (April 17-23, 2019), the company will make a donation to the Wildlife Conservation Network (WCN) to help protect penguins across the southern hemisphere. ‘Penguins’ is a coming-of-age story about an Adélie penguin named Steve who joins hundreds of thousands of fellow males in the icy Antarctic spring on a quest to build a suitable nest, find a life partner and start a family. None of it comes easily for him, especially considering he’s targeted by everything from killer whales to leopard seals, who unapologetically threaten his happily ever after. Ed Helms narrates the film, offering insight into the Adélies’ way of life, as well as Steve’s inner thoughts as he fights to start, and protect, his new family. 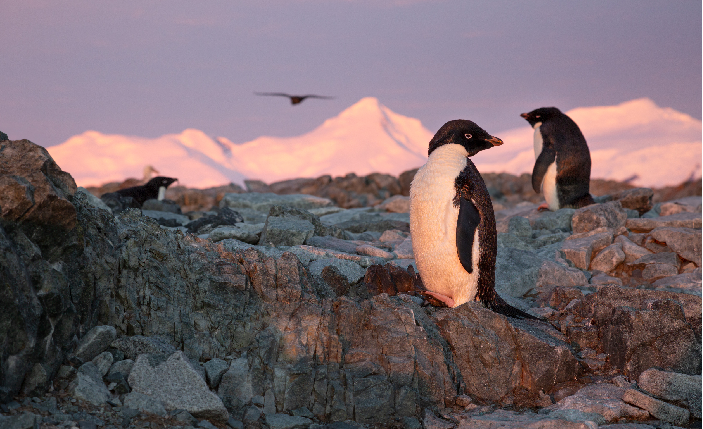 The film’s directors, Alastair Fothergill and Jeff Wilson, rightfully forgoed the usual documentary style of mainly reciting facts about the subject, and instead crafted an equally comical and sentimental view into the Adélie penguins’ way of life. The aquatic bird’ charismatic nature is alluringly told through Helms’ equally comedic and emotionally heartfelt narration. His commentary doesn’t make light of the species’ fight to survive in such brutal weather conditions, but doesn’t make their lifestyle overly dramatic, either. ‘Penguins’ offers an enthralling, engaging and factual balance into the perseverance that the title aquatic birds need to survive. The narrative perfectly captures the struggles and rewards that a penguin like Steve has while living in a colony, particularly as a first-time father who’s trying to raise his chicks with his partner in the harshest winter weather conditions in the world. Like all of Disneynature’s previous documentaries, ‘Penguins’ is especially breathtaking in the way the story is visually presented on screen. Led by cinematographer Rolf Steinmann, a team of 16 principal photographers was assembled to capture astonishing imagery of the penguins, including of their joyfully spirited synchronized swimming, during which time the animals zoom in and out of the water in a perfectly timed rhythm. The members of the cinematography team immersed themselves in multiple polar locations around Antarctica, including Cape Crozier, which allowed them to gather footage on land, underwater and from the sky in helicopters for over the course of three years. While the logistics of traveling to, and then filming at, the locations was challenging for Fothergill, Wilson and their team at times, the crew’s extensive scientific research into the title animal’s behavior, as well as the weather conditions, allowed them to capture magical moments between Steve and his fellow penguins.